Clean pork pata. Slit skin (3-5 slits on each side) without cutting the bone. Place pork pata in a big pot. Add soda pop and water enough to cover the pork. Season with plenty of salt. Add peppercorns, crushed garlic, bay leaves and soy sauce. Covered and boil over high heat. Remove all the resulting scum that will rise to the top of the pot. 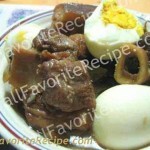 Lower the heat and simmer for about an hour or until pork pata meat is tender (make sure that meat is not too tender). 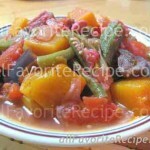 About 15 minutes of simmering, add baking soda (to soften the meat faster) and continue cooking. Drain pork pata when done. Let sit for a while so the juices settle. Dry with paper towels. 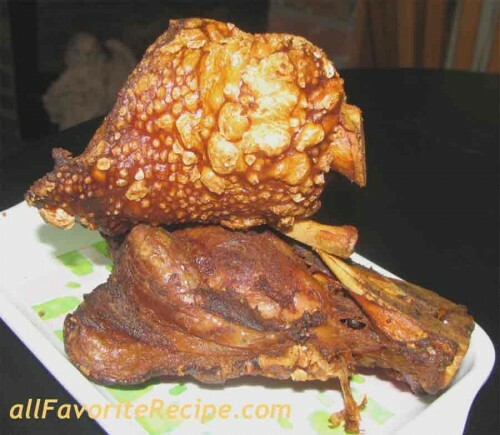 Deep-fry pata until golden brown and blisters appear on skin. Drain on paper towels. Slice meat and transfer to a serving plate. Serve hot with sauce for dipping. Make sauce by combining soy sauce and white vinegar. You may add garlic, onion and chili pepper. Depends to your liking. Enjoy your crispy pata. !